Remel London and the RateMePlz team are doing it BIG this time around. Teaming up with Bigga Business for the ultimate networking experience and is offering YOU the chance to kick start your business with £10,000. 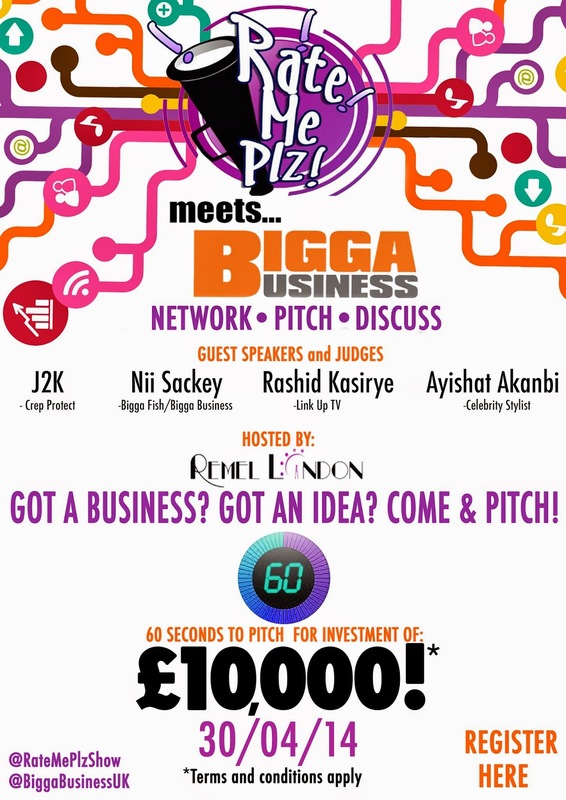 RateMePlz meets Bigga Business and presents this brand new business show and networking event. Already known for putting on some of the best events in London over the past two years providing a platform for new music acts and has seen some of its past performers go on to top the charts, tour the UK, overseas and also introduced upcoming talent to some of the most respectable names in the entertainment industry. The RateMePlz team have expanded their brand and will be showcasing new talent in all aspects of the entertainment industry, by providing a networking opportunity with industry professionals from the business, music, fashion, beauty and broadcasting industries and lots more. This being the first of many business show and networking events to come in 2014. On the night, take part in a Q&A with industry professionals, network with like-minded people and pitch your business idea to us in the RateMePlz 60 seconds business pitch challenge, for your chance to win £10,000. Lily Mckenzie will take to the stage and perform on the night - this is certainly not to be missed. Interested in taking part in the RateMePlz 60 second business pitch challenge? All you simply have to do is turn up, sign up and get rated! BRING YOUR BUSINESS CARDS, and NETWORK!